An ex-con was sentenced Tuesday to 27 years to life in prison in connection with a shooting last year in the Gaslamp District that left an off-duty sheriff’s deputy and a visitor from Hawaii wounded. 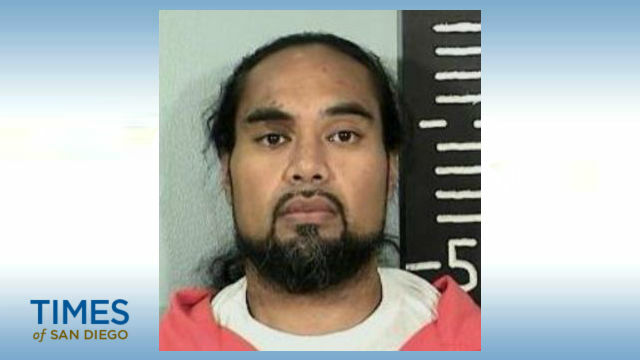 Ray Pitoau, 38, was convicted in July of three felony firearm counts, but jurors deadlocked on three counts of assault with a firearm. A second trial last month also ended in a mistrial on the assault counts. Before sentencing the defendant, Superior Court Judge Melinda Lasater declined to dismiss the outstanding charges, saying new information — including the arrest of Emory Zinga, who was with Pitoau the night of the Aug. 7, 2017, shooting – was enough to warrant a third trial. “(Pitoau) has an issue with being violent,” the judge said. Reilly said Pitoau was basically a “career criminal” who has been to prison four times. The only times Pitoau isn’t committing crimes is when he’s incarcerated, the prosecutor said. If convicted on the assault with a firearm charges, Pitoau could face an additional 105 years to life behind bars, Reilly said. Prosecutors said Philpot, his two brothers and two off-duty Escondido police officers walked past Pitoau on Island Avenue near Sixth Avenue just after 1 a.m., and Pitoau and Philpot’s younger sibling Joshua traded insults. Pitoau pulled out a gun and pointed it at Joshua before the deputy charged the defendant, according to the off-duty lawman. Jason Philpot — an 11-year veteran of the Sheriff’s Department — testified that he tried to wrap his arms around Pitoau and get the gun away, but the defendant was able to pull the trigger, wounding the deputy in the upper chest and right arm. A second round also passed through his right arm. One of the rounds ricocheted off the sidewalk and struck Vladimir Shvets, a passer-by in San Diego for a convention. Pitoau put on a pair of black gloves and pulled up his shirt to reveal a gun, Reilly said.